(S)-10-Hydroxycampothecin (10-HCPT) is a derivative from natural campthecin, a cytotoxic quinoline alkaloid originated from camtotheca acuminata or Nothapodytes pittosporoides(Mappia).Camptothecin was discovered in 1966 by M. E. Wall and M. C. Wani in systematic screening of natural products for anticancer drugs. 1. 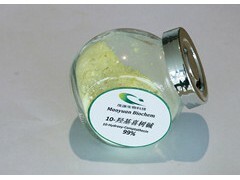 (S)-10-Hydroxycamptothecin with purity 99% by HPLC,in house standard. 1. Single impurity of 10-hydroxycamptohtecin: less than 0.5% generally, <0.1% as required. 2.Leading natural plant ingredients supplier in China with 16 years’ experience. 3.13000 square meters production area and more than yield of 50kg 10-Hydroxycamptothecin per month. 4.Professional R&D team and strong R&D strength. Packing with IATA required carton with 5kg/carton, or as customer required. 10-hydroxycamptothecin showed remarkable anticancer activity in preliminary clinical trials by inhibiting the DNA enzyme topoisomerase I (topo I). (S)-10-Hydroxycamptothecin is a clinical therapy agent against hepatoma. 1. (S)-10-Hydroxycamptothecin is the natural starting material of Irinotecan HCl. 2. (S)-10-Hydroxycamptothecin is the natural starting ingredient of 7-Ethyl-10-Hydroxycamptothecin(SN-38). 4. This compound 10-hydroxycamptothecin is a featured product for Apoptosis research. 1. Camptotheca acuminata (Camptotheca, Happy tree), a tree native to Hunan ,Guangxi, Sichuan province of China. Camptotheca acuminata used as a cancer treatment in Traditional Chinese Medicine.Generally, the leaves and the fruits of happy tree are applied for the extraction of camptothecin. 2. Nothapodytes pittosporoides(Mappia), a tree wild spread in Hunan ,Guangxi, Sichuan province of China. The root of the tree is applied for the extraction of campothecin, most of this origin is applied for R&D.